Today was one of those days - the kind of day that made me want to live on San Juan Island in the first place. The title of this blog post is rather unoriginal, but it's probably the phrase I most uttered today, so I thought it was appropriate. 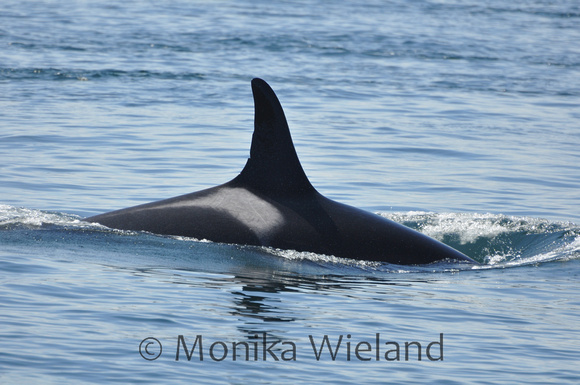 We went out to the westside around noon today with word that some whales were heading down from the north. Just as soon as the boats and some distant blows were coming into view to the north of Lime Kiln Lighthouse, we heard some people screaming to the south of us. I turned around and saw a big disturbance in the water just offshore of the rock to the south of me. 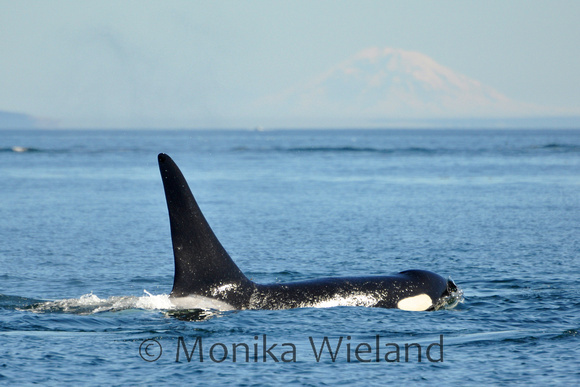 A few seconds later, just long enough for me to grab my camera but not to adjust any of the settings, this big male orca surfaced just north of me, cruising north towards the other whales heading our direction. Surprise! It was L85 Mystery, and right behind him were the rest of the L12 sub-group. 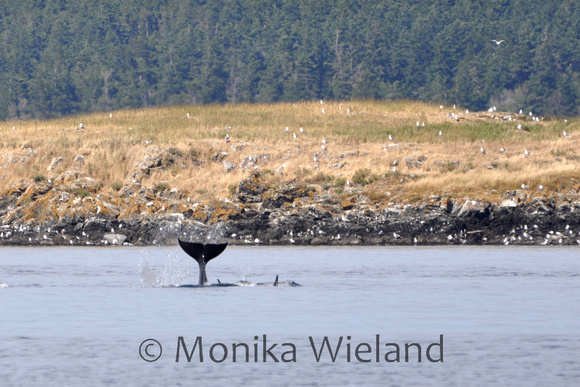 This family group of whales likes to spend a lot of time off the southwest end of San Juan Island, going up and down, up and down, but rarely really committing to going north. 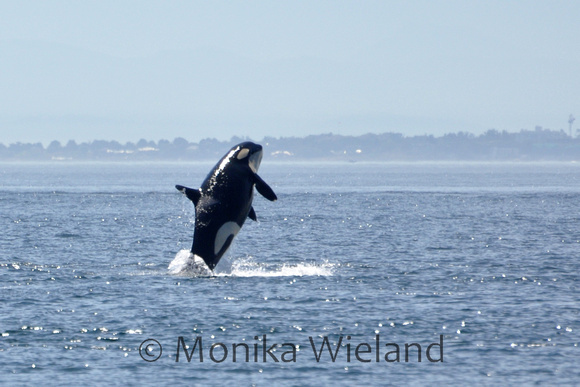 They're well known among shore-based whale watchers as the group that just comes into view at Lime Kiln before nearly always turning south again. 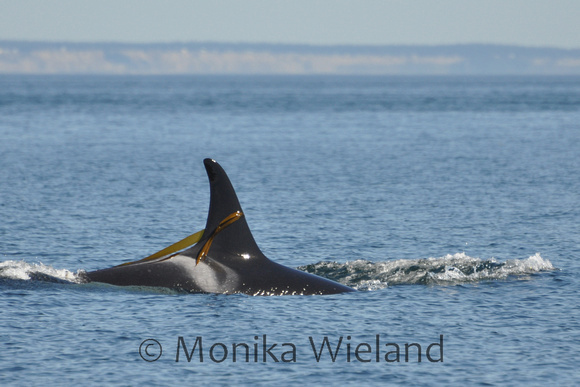 This afternoon, however, they were interested in going just a little bit further north to meet up with some of their J and K Pod friends. Best of all, as they sped north, they did so very close to shore. I've never seen anything quite like it! 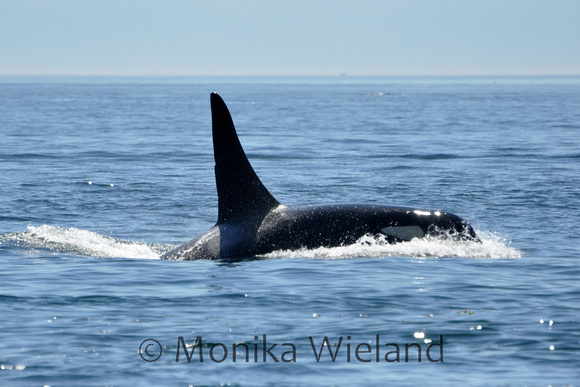 He even seemed to perk up and get interested as the whales started coming by, but then I must admit I lost track of him as my focus returned to the orcas. 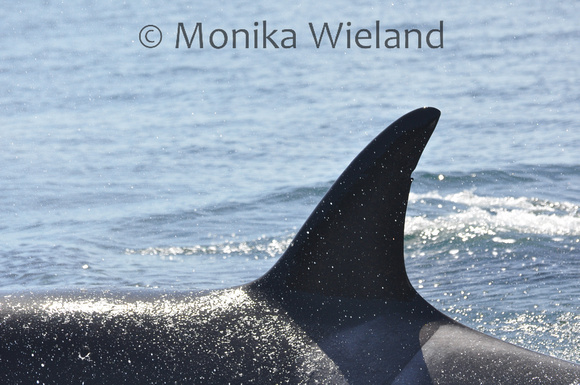 All the male orcas seemed to be grouped up, which was an impressive sight with all those tall dorsal fins. 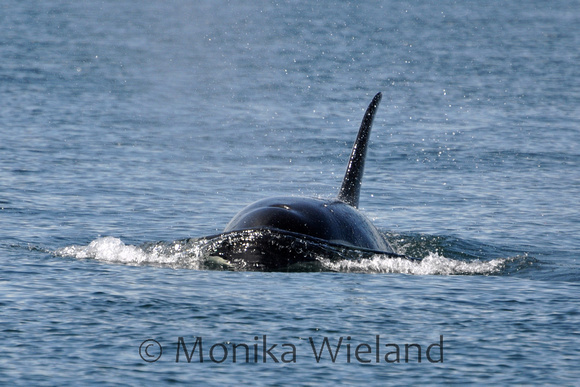 Here's L41 Mega and K25 Scoter, and at least J27 Blackberry and J34 Doublestuf were in there with them, so I suspect the other L12 subgroup males were as well. 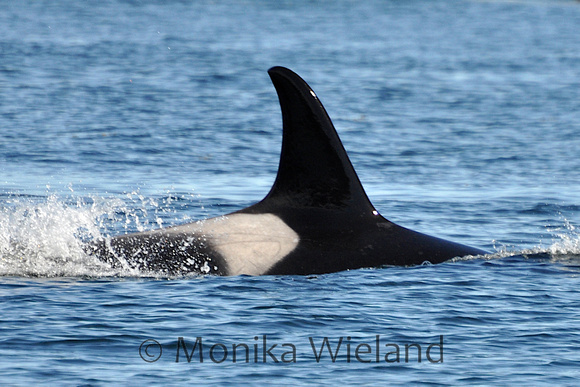 It turned out to be J31 Tsuchi and L77 Matia, two female whales ages 16 and 24. I always think it's especially cool to see whales from different pods hanging out together. 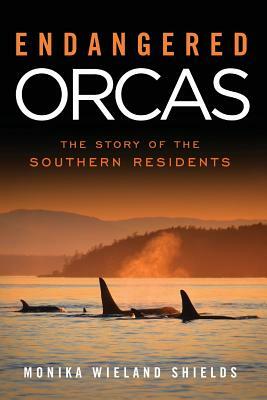 It's a glimpse into the social lives of these animals outside of their matrilines, with whom they travel with 24/7. 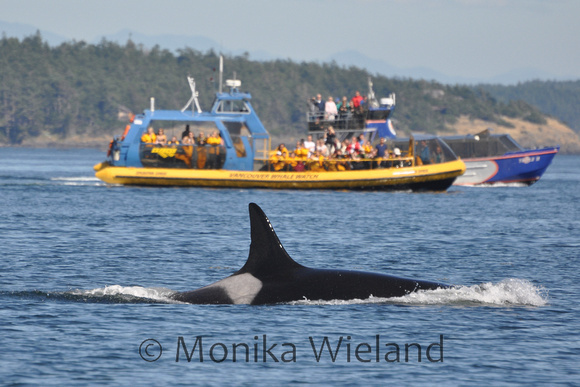 So after the L12s had gone north, the L12s, K13s, and half of J-Pod (the J11s, J22s, and J17s) came back south. Where was the rest of J-Pod? 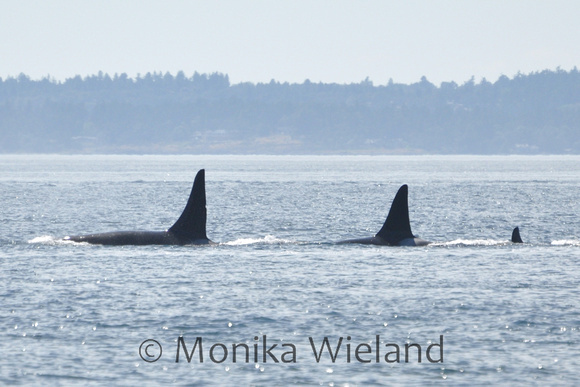 They were coming down San Juan Channel past Friday Harbor, which gave us enough time to drive down to Cattle Point to see them down there. We got there a little ahead of the whales, and while waiting for them we saw lots of other wildlife, including a single male Steller sea lion over on Whale Rocks. I was also watching a single rhinoceros auklet diving on a school of small fish. 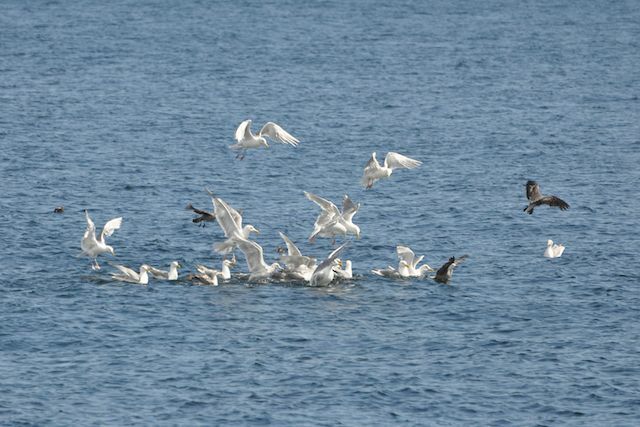 Every time it dove, bait fish would start jumping at the surface, and a single glaucous-winged gull was sitting on the water nearby and taking advantage of this feeding opportunity. 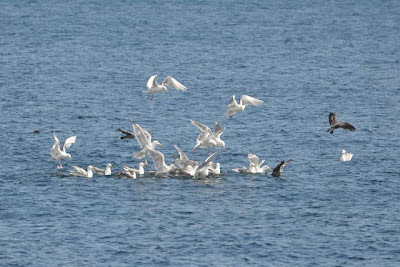 As we watched, more gulls came in, and then more auklets, and then some pelagic cormorants, and some Heermann's gulls, and before we knew it a nice bait ball had formed. Then the whales came into view passing Cape San Juan close to shore, heading south towards where we were on the rocks in Cattle Pass. I was excited they were on "our" side of the channel, but I know they usually veer out and go around Goose Island. In fact, I heard some people commenting on the radio that they had never seen them go inside of Goose Island. 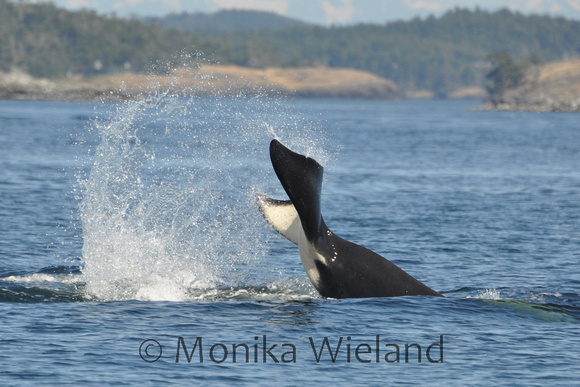 Well, if you keep watching these whales, every so often you are going to see them do something you've never seen them do before, and today was one of those days! 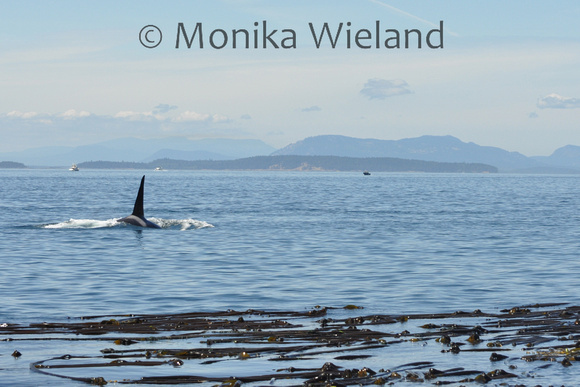 They swam through the San Juan Island side of Goose Island! 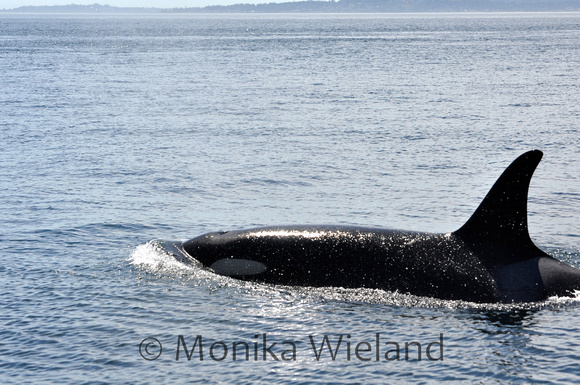 J26 Mike was looking good - I remember seeing him before he was even a sprouter male, and now he's so huge! He must have been feeling good, too - look at that tail slap! 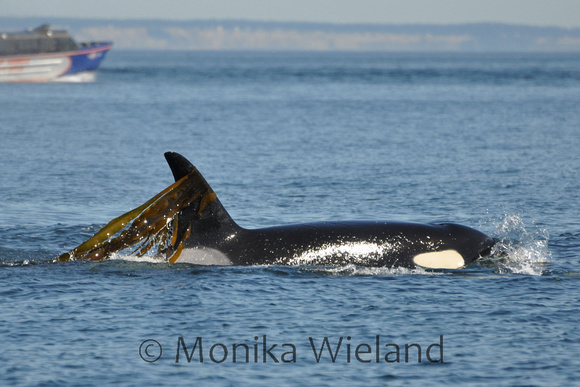 Not to be outdone by her mother, J37 Hy'shqa surfaced with kelp, too - a lot more of it! If you want to take another look at all the above whale photos from today, you can look at the gallery here or see a slideshow of them here. I'm sure you can see how after this epic whale-of-a-day, the only words I could come up with to summarize it were: That was awesome. Thanks for sharing Monika! 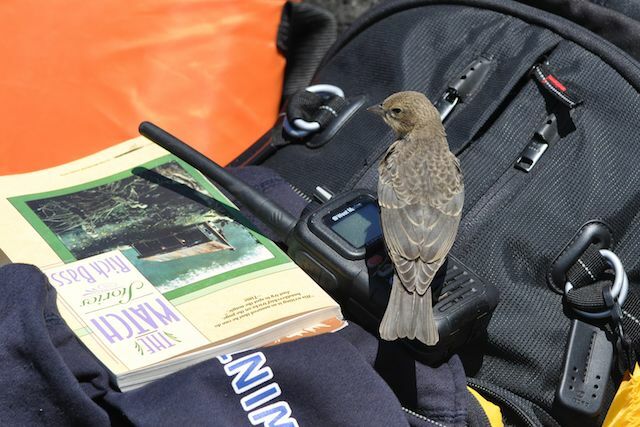 It truely was an awesome San Juan Island day. And the weather was actual something like summer to boot! WOW! That about sums it up! we over here find you Americans use the word awesome for mundane and mediiocre things far too often...not in this case though!!! Bet you could hear their heart beats they were that close!!! Awesome indeed - I'd have been ruly awestruck had I been on those rocks...great stuff. BTW is there a J77 and if so who? Dave - There's no J77 yet. 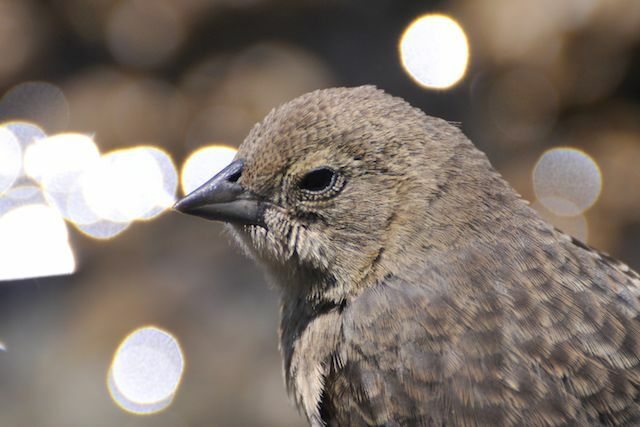 They were originally numbered in the order they were identified and then new births get the next number in line. 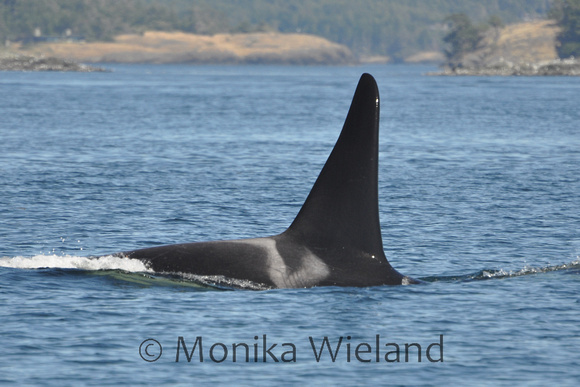 J-Pod is up to J47, K-Pod up to K44, and L-Pod up to L118. I've only come down to the San Juans once (many years ago), and though we didn't see Orcas, we did see porpoises (first time for seeing them from any shoreline). I think we'll have to return just for a chance see our own "that was awesome" moment. Thanks Monika - someone near us has a big American car (unusual in itself over here) and the reg is J77 POD, a personalised plate as the car is a lot newer than an old J reg would be.